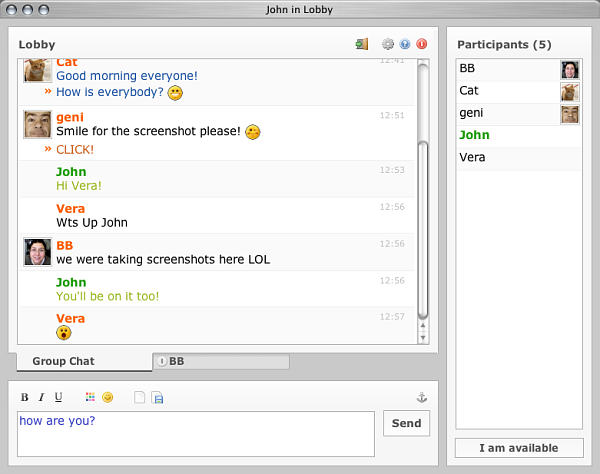 RealChat combines a high performance Java chat server with a lightweight Ajax chat client. You get tabbed chat, private rooms, customizable appearance, web-based configuration, and more! Easily integrate RealChat with your user database so members can use their existing profiles. Ready-made plug-ins available for phpBB, Invision PB, vBulletin and more. Completely private-brand the software, including your own identity in the "About" section. A dedicated server or unrestricted shell account on a shared server. ...... Completely private-brand the software, including your own identity in the "About" section. Host multiple independent virtual chat servers on a single server. RealChat ISP Edition comes with five virtual servers licenses included. Additional vServer licenses may be purchased to increase the number of virtual hosts allowed. Qweas is providing links to RealChat 5 as a courtesy, and makes no representations regarding RealChat or any other applications or any information related thereto. Any questions, complaints or claims regarding this application RealChat 5 must be directed to the appropriate software vendor. You may click the publisher link of RealChat on the top of this page to get more details about the vendor.